Do you want to do something big with your life? I bet you could use more time! Read this to find 5 killer…and unusual…ways to optimize your time management, productivity, and results. To frame up this article, let me start by saying I’ve met numerous folks who appear to have a great deal of success. But once I get to know them better, I discover they live a very unbalanced life. Their success in one area comes at the expense of their family, health, and more. This is not what I want for myself or you. If you’re not familiar with me, you can check more about me here. But let me summarize by saying I was able to successfully exit the corporate world, leaving behind a 6-figure job. I now make much more money and have a much more balanced life. I do what most people would probably consider about 3-4 full-time jobs, yet I don’t work long hours. In fact, I “work” much less than when I had my corporate job. So let’s just say I know a thing or two about optimizing time. So let’s talk a better way to live. Finding time to launch a huge endeavor is never easy. In fact, if you have a spouse, kids, pets, and a full-time job, you may feel like you have zero minutes available for you and your vision. This is exactly how I felt. But what’s amazing is other people in your situation have accomplished massive success and have balanced lives. So what’s the difference? Why not you? That’s what I’ll explore in this post. And I think you’ll find some unusual recommendations here…things you won’t find in the cookie-cutter lists out there. As you know, our daily actions and habits compound into big results. Time is no different. Time comes down to our day-to-day choices. If you are ruthless about your time, you will make time and you will make the best use of that time. And if you are going after a goal that is truly in-line with your passions, you will want to devote your time and energy to it. Time is critical. You owe it to yourself to figure out how to optimize it. This post doesn’t discuss different ways of tracking time and finding ways to remove waste (a topic for another day), but it will tell you how to optimize the time you do have and spend it wisely. Using your time productively does not always mean working. Perhaps having a picnic with the family will allow you to recharge and bond with your family. Whatever the use of your time though, being present allows you to realize the most from that time. By segmenting your time, you are more likely to make the best of it. Indeed, when Warren Buffet and Bill Gates were asked what the single most important factor for success was, they both independently answered “Focus.” The ability to sit down and work deeply on one item at a time. For a deep dive on this topic, consider reading Deep Work by Cal Newport. Try setting aside time for each of these throughout your days and weeks. Actually put them on your calendar and give 100% during each timeslot. This tip plays off Tip 1. By focusing your time, you’ll feel as though you create time out of nowhere. Numerous studies have shown the tremendous “switching cost” you pay as your brain switches from task to task, concept to concept, or segment to segment. The problem is, I don’t like to over-plan my day. Perhaps blocking off time and strictly adhering to your detailed plan works for you. But I find I can’t stick to something this structured. Daily distractions and interruptions can blow my plans up quickly. Fortunately, there’s a great way to manage this that isn’t too structured. It’s called The Pomodoro Technique. You spend 25 minutes focused on one task. Once the 25 minutes is up, you take a 5 minute break to do whatever you want. Then you do another 25 minute chunk of productive work on a specific task. You can even have a 25-minute slot to deal with social and other distractions. Clear them off your plate in one swoop. Say hello to your new time manager. If you’re interested in The Pomodoro Technique, simply search for it and you’ll find apps for your computer or other devices that will manage the timing for you. You can even purchase a Pomodoro Timer to set on your desk. Distractions in your environment can take many forms. If you’re looking to spend more quality time with your family, prepping and cooking a nice dinner over a glass of wine is a great way to do it. But what if you have a football game on the TV in the background? Is your environment optimized for the purpose you have assigned to that time? I’ll let you explore concepts around your home more on your own, but I will give you some thoughts for your office. The “right background music” is a shockingly big one for me. When I notice my concentration, productivity, and agitation all going the wrong direction, I often pause, pay attention to the noise around me, and then change it. The easiest way to do this is to pop in some ear phones. You may have seen that the “Weightless” song or “Weightless (Ambient Transmission, Vol 2)” album by Marconi Union (Google Play or iTunes) were determined to reduce anxiety by 65%. I’m not worried about anxiety, but listening to this album does wonders for my ability to focus and get stuff done. The album itself is about 42 minutes long, yet I’m always completely shocked when it’s over. It gets me in a productivity zone and acts as a Pomodoro Timer of sorts. Give me that album, some ear phones, and a laptop…and I will get stuff done. Music is such a small example and it may be personal to me. What changes in your environment will result in differences in your productivity? Now that you’ve looked around yourself for optimization, it’s time to turn internal. We all perform better at certain tasks at certain times of day. When do you have your best workouts? When do you do heads-down, creative tasks best? When do you do people interaction tasks best? When do you knock out emails most efficiently? When is it best for you to fall asleep and wake up? Do you schedule your day accordingly? Or do you let other people and the day’s events determine your schedule? Get proactive. It’s good to note that these times change over the course of your life. If I was particularly passionate about a creative project, I used to love to stay up late and work on it. Now, for whatever reason, that no longer works. Rather, I now tackle work like this early in the morning and mid afternoon. Just know that we all have best times of day to get certain types of tasks done. If you can organize your day in harmony with your body’s preferred cycles, you will likely be happier and much more productive. Study after study shows that we perform better mentally and at work when we incorporate physical activity into our routines. If you’re not active, you’re robbing yourself of potential and your ability to enjoy life. Crazy list, isn’t it? You can check out more in this study review by Ron Friedman, PhD at Harvard Business Review. The upshot is you can take time out from your day to be active, yet still get more work done that day. This is the part where I say nutrition is highly individual. You need to consult a qualified doctor to determine the right optimizations for you and your current situation. Look, if you do not understand how to eat well, you need to research it. It’s not complicated, but most people get it wrong. Once you understand how to eat well, you need to implement it and actually eat well. Don’t chase after a diet or fad. Eating well is a pretty simple process and mostly involves sticking to basics such as vegetables, fruits, nuts, legumes, and lean proteins. And I can tell you it also involves staying out of the pantry and freezer! Additionally, you will find that you cannot get enough of certain factors by foods alone. Said another way, you might be able to enhance your productivity by supplementing your diet. Talk to a nutritionist or doctor to see what may benefit you. Some to consider include Zinc, Magnesium, B6, Choline, L-Glutamine, probiotics, and of course caffeine. Speaking of caffeine, it can be greatly beneficial to productivity. But too much can have some nasty effects, making you feel irritable and scattered. You need to figure out your optimal levels and when it is best for you to ingest caffeine. While some people can “drink a cup of coffee” right before bed and fall asleep just fine, the quality of their sleep is almost certainly impacted. Proper sleep and recovery go a long way toward your personal optimization, so don’t let caffeine or other factors get in the way of a good night’s sleep. Apart from getting a good night’s sleep, which is both a quantity and quality issue, recovery needs to be addressed. If you’re excited about a project and you’re putting yourself into it 110%, your results will begin to taper…no matter your enthusiasm level. Further, if you’re supplementing, working out, and really pushing yourself, you are in definite need of reset on occasion. Fast! Not eating gives your digestive system a chance to stop working 24×7. This can allow it to do some deeper processing, prep itself for better nutrient absorption, and share some blood with the rest of your organs. I’m a big fan of intermittent fasting. I will pick a week and then avoid eating until dinner time each day. In fact, I wrote most of Leave the Grind Behind while fasting. My energy levels shot through the roof. It’s too much to explain here, but if you are healthy enough and haven’t tried it before, do it. I think you’ll be shocked by how easy it is and how significant the physical and mental results are. Here’s a fasting approach from Chad Waterbury you can explore. Cycle supplementation 21 days on, 7 days off. Take a day off–completely off–from work. Nap, hike, or do whatever removes you from the day-to-day clutter that fills your mind. When you do a reboot, the goal is to be itching to get back to dominating your life. You should come back with ideas, massive enthusiasm, and much better ability to get stuff done. Have I mentioned this one before? Oh yes…EVERY time I write about time management and effectiveness. Let me repeat: Nothing will make you use your time better than writing—by hand—a list of things you need to do for the day. If a phone call, request, project, or email hits you, it feels urgent. And it will stick in the back of your mind until you get it done. It creates chaos. That is unless you write it down and decide to get to it when appropriate. Handwritten to-do lists allow you to operate by your urgency ratings, not someone else’s. They help you focus. They help you determine what’s really important. There is no big secret to keeping a list of things to do, but don’t let the simplicity of these lists fool you. Each day, before logging in to my computer, I write down what I want to accomplish that day. My goal is to feel like my day was productive. I will have kicked the ball forward enough keep the momentum I need. Getting into a list-making routine is particularly great when you feel stressed, overwhelmed, or disorganized. Lists allow you to account for things that need to get done, which takes the organizational load off your brain. What’s most shocking about making a handwritten list is that I usually finish the tasks on my list much faster than I expect, and I certainly accomplish more than if I hadn’t written a list. Think about that. I do more in less time. Having accomplished my list, I can move on to other activities and time segments. I can move on to creative big-picture items precisely because my brain isn’t cluttered with outstanding things to do. Once you begin to see this process in action, you’ll realize how much time you waste if you are unfocused. It’s absolutely incredible. And by the way, I am not an organized person by nature. Planning and organizing are difficult for me. 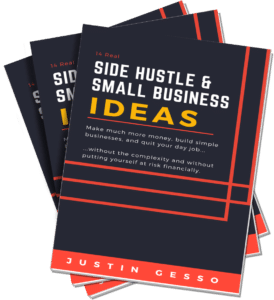 If you’ve found it difficult to utilize more complex planning systems in the past, the simple daily method in this workbook may be just what you need. The simplicity works wonders for me and ensures I get it done. Just remember…it’s important to use this sheet every day. I have tried numerous online or otherwise electronic to-do lists and they just don’t work. If I write out my to-dos, I get the done. If I type to-dos, I let the list build up. Get writing. Alright, I like this one so much, I’m going to sneak it in. Gamify your habit and to-dos. Ultimately habits will become ingrained in your life and will no longer take conscious pressure. But when you first start new habits, such as time blocking and to-do lists, it will help drastically to track their completion. Why not have fun with this? Seek out an easy, rewarding way to track habit progress. Consider apps such as LifeRPG, Habitica, and HabitBull. Habitica is my favorite. It’s free. I recommend you set it up on a full computer, but you can then do your daily progress checks in it on your mobile. There are a lot of ways to squeeze more out of your day and start building your legacy. Don’t watch as others build theirs…get yourself in the game and accomplish what you’ve always wants to accomplish. Feel for yourself how these practices can accumulate in your life. 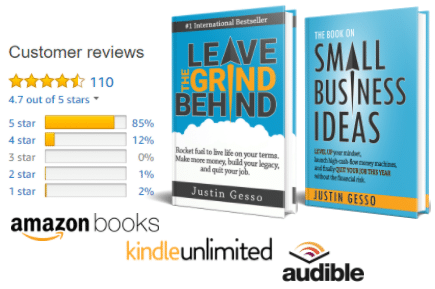 And again, if you enjoyed this article, be sure to grab my bestseller Leave the Grind Behind. Thanks for reading. This is stupendeous ,great Justin.